The material was collected and maintained by Hilary Brown until her death in 2007. 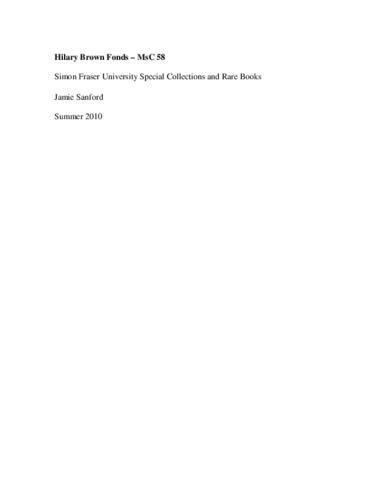 Simon Fraser University Library, Special Collections and Rare Books acquired the materials in several accruals from 2007-2010. The fonds consists mainly of textual materials, including correspondence and diaries. Also present are photo albums, scrapbooks, photographs, slides, and audio cassettes. The fonds has been arranged into the following eighteen series: Heron Rocks Friendship Centre Society (1968-2005), Heron Rocks Camping Co-op (1952-2007), Tomorrows Ancestors (1964-1985), China (1936-1996), Personal correspondence (1932-2005), Island’s Trust (1970-2002), Community activities and interests (1942-2004), Women’s issues (1938-2003), Writing, lecturing and broadcasting (1933-2000), Memoirs (1909-2000), Diaries (1929-1984), Notebooks (1930-1990), Address books (1970-1980), Correspondence to Harrison Brown (1935-1971), Correspondence from Harrison Brown (1931-1975), Photographs and slides (1909-2007), Audio cassettes (1974-1992), and Ephemera (1910-2003). The materials were arranged according to the original filling system of the creator and to facilitate research. Also see the Harrison Brown Fonds located at Simon Fraser University Library’s Special Collections and Rare Books department. Includes 6 diaries, 5 notebooks, 3 address books, 8 photograph albums (ca.1000 photographs), 19 negative sheets, 1 scrap book, 604 slides and 57 audio cassettes.